Autographed cards from stars like Paul Pierce, Bill Self, Roy Williams, Danny Manning and other popular KU alumni are sprinkled throughout the product! 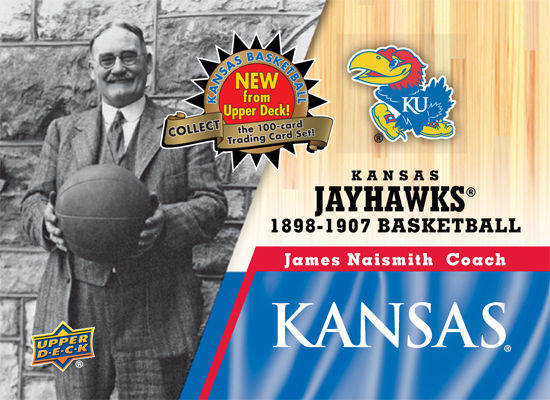 Carlsbad, CA (October 03, 2013) – The Upper Deck Company has just released a star-studded collection of college basketball cards focusing on one of the NCAA’s most storied programs: the University of Kansas Jayhawks. The 100-card set celebrates the rich history of the Jayhawks basketball program – and includes autographed cards from standout players and coaches. What’s more, in the “Monumental Moments” subset, a variety of meaningful moments are covered while also paying tribute to unique elements of the school like the opening of Allen Fieldhouse and an image of James Naismith’s original rules of basketball which were recently donated to the school. The product is loaded with all the big names you would expect from James Naismith to Phog Allen, from Wilt Chamberlain to Paul Pierce, it spans the history of the program to bring you the greatest line-up of Jayhawk basketball superstars ever to dribble a basketball. And what is even more exciting is the opportunity to score rare autograph cards from many of these big name talents randomly inserted into the product. Some lucky collectors can also find limited-edition dual and triple autograph cards. 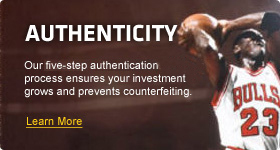 All autograph cards are inserted live into the product, as no redemption cards were issued. The card set was produced through Upper Deck’s exclusive partnership with the Collegiate Licensing Company. Beyond the 76 player cards featured in the base set are a variety of compelling insert sets as well. The “Final Four Legacy” subset chronicles 10 stellar players who made huge impacts in the NCAA tournament. The “Distinguished Numbers” insert set pays tribute to some of the greatest players to wear the KU jersey. The “Jayhawk Hall-of-Fame” insert set calls out players and coaches who have distinguished themselves as the best in the game. And the “Jayhawk Legacy” insert set is comprised of 30 cards and speaks to players who are beloved members of the KU family. Aside from Hobby boxes, which boast 24 packs per box and eight cards per pack, a separate retail Blaster Box version exists. The latter includes 10 packs per box, eight cards per pack. What’s unique about the Blaster boxes is that each one contains a bonus National Championship replica banner. Fans can buy blasters and collect all five of KU’s men’s championship banners, which is certainly a must-have for fans looking to celebrate this championship history of the school. 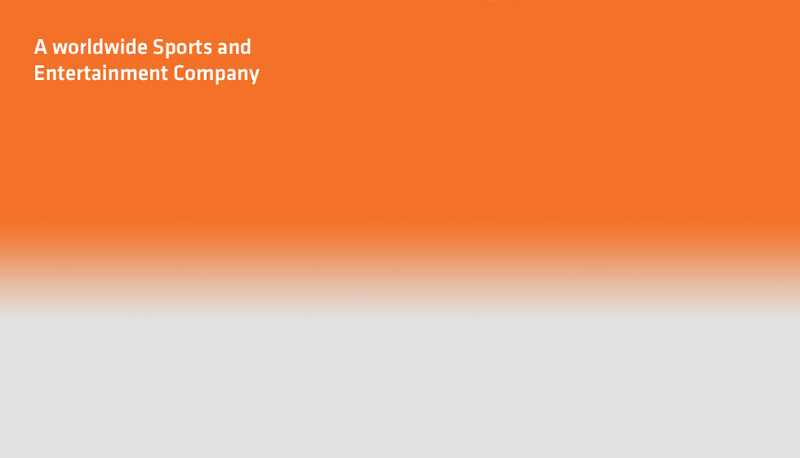 CLC is a division of global sports and entertainment company IMG. Founded in 1981, CLC is the oldest and largest collegiate licensing agency in the U.S. and currently represents nearly 200 colleges, universities, bowl games, athletic conferences, The Heisman Trophy and the NCAA. The mission of CLC is to be the guiding force in collegiate trademark licensing and one of the top sports licensing firms in the country. CLC is dedicated to being a center of excellence in providing licensing services of the highest quality to its member institutions, licensees, retailers and consumers. Headquartered in Atlanta (Ga.), CLC is a full-service licensing representative, which employs a staff of 80 licensing professionals who provide full-service capabilities in brand protection, brand management, and brand development. For more information on CLC, visit: www.clc.com or www.imgworld.com.